Packard Bell is renowned for offering good value machines at prices that are hard to beat, but in the past we've often been left wanting when it comes to designs that stand out. The EasyNote TJ65-AU-010UK looks set to change this, offering a highly stylish design at an impressively low price. The 15.6-inch screen is great for movie playback, with a wide 16:9 aspect ratio that keeps intrusive black bars at the top and bottom of your films to a minimum. The 1366 x 768-pixel resolution serves up decent image quality and it's both a vibrant and vivid panel. 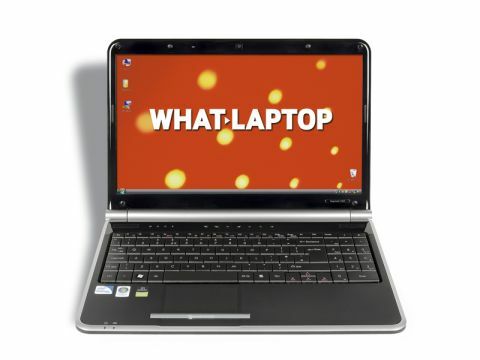 Multimedia capabilities are limited, due to the use of a low-powered integrated graphics card. Although it means gaming is out of reach, we still had no trouble running standard office tasks, watching DVDs or browsing the web. The keyboard is large and a good amount of travel makes it a pleasure to type on, with a smooth and responsive typing action. The fact the keys are flat and don't taper at the edges can make it tricky to adjust to, however, and you'll have to be quite precise in your typing to keep mistakes to a minimum. Quality is excellent throughout this machine, and it's also one of the most attractive at this price point. The mix of glossy, matt and patterned plastics look good and prove robust, and the circular hinge also gives it a distinct appearance. Red, touch-sensitive buttons also help it to stand out and offer enhanced functionality. The thin strip that serves as both mouse buttons doesn't work quite so well, however, proving fiddly to use. Costs have been cut when it comes to the components. The Intel Pentium T4200 processor is a budget chip and, although it runs at a reasonable 2GHz, this isn't the quickest machine to boot up or shut down. With 4096MB of memory, however, we found it fine once up and running. It's also a good choice when it comes to features, with four USB ports in place for adding your peripherals, and an HDMI port for hooking up an external high-definition (HD) display. The 250GB hard drive offers plenty of storage space, with a tri-format DVD rewriter also in place for backing up your files. 802.11g Wi-Fi and Gigabit Ethernet are provided for high-speed wireless and fixed connectivity. Overall, despite its flawed office and multimedia capabilities, we really like the EasyNote TJ65-AU-010UK. It's a stylish, well made and competent machine.